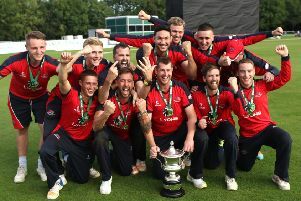 Cricketers from Dublin-based club Rush duly completed an Irish National Cup double over local teams when they saw off Academy at the weekend. They knocked Templepatrick out at the first-round stage and on Saturday advanced to the quarter-final with a six-wicket win against the Hydepark lads in Dublin. When Matthew Palmer’s side posted 243 in 48.3 overs, hopes of an NCU win were high, but the Dubliners needed only 44 overs for the loss of four wickets to progress. Mitchell Atkins top-scored for Academy with 51, while Danny McFadden just missed out a half-century with 45, and Andrew Magee contributed a useful 30. Atkins’ all-rounder qualities were on show when he posted bowling figures of 2 for 31, while local batsman Jenson hit the top score of the afternoon with 80. Derriaghy, Dundrum and Newbuildings are the only three northern teams through to the last eight. Meanwhile, Newbuildings were handed an easy passage to round two of the Ulster Cup with a walkover against an absent Academy on Sunday. Back home Michael Warke’s 2nd XI enhanced their joint-top NCU Junior 2 position with a comprehensive win against Lurgan II at Castle Grounds. Mark Shields was their star performer with an impressive, unbeaten knock of 130 in his side’s daunting total of 259 for 7 in their 40 overs. Club stalwart David Greenlees weighed in with 50, while South African Michael Bentley notched up 35. Faced with scoring more than six an over, the visitors were always struggling and finished on 129 to give Academy a victory by 130 runs that kept them level at the summit alongside Carrick II and Donaghcloney II. Conor Boyd was tops in the bowling department with 4 for 20, with support from Michael Wilson (3 for 22) and Darren Ryles (2 for 10). Greenlees caused the run-out with a neat return from long-off to the bowler’s end. Players and officials had been looking forward to this weekend’s local derby with Templepatrick, but this one has been rearranged for Sunday, July 5 owing to Robert Smith’s side having a Challenge Cup tie with Instonians in Belfast on Saturday. The other fixtures are: 2nd XI x Carrick II, away; 3rd XI v Armagh II, home; 4th XI v North Down IV, away (Sunday).